Simone Thompson was homeless child of an incarcerated mother. At four years old she was shuttled between Minnesota origins to her mother’s mother in Los Angeles. Simone had tattoos everywhere including the Egyptian Horus symbol on her wrist. She grew into a young lanky woman. One day sitting on a bench at a bus stop in Los Angeles, she was discovered by a male model who proved himself worthy by showing her actual images of himself. Model, Ash Sytmest, was successful in winning her approval. Simone Thompson then decided to become a model, with a name change to ‘Slick Woods’. In a blink she moved from homelessness to representing her generation as a model ‘from the hood’ in fashion and tattoos! 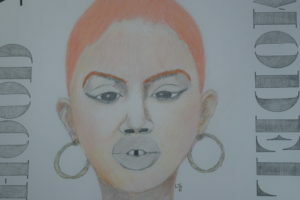 Slick’s ‘gapped’ teeth, a beauty sign from African origins. This feature makes her unique as a model. That gap surrounding by big lips separates her from peers where others try to compare her. Slick claims ‘small’ narrow eyes makes her different. She has exploded onto the fashion stage modeling Rhianna’s Fenty Beauty makeup line. Defined by her past as an outlier, ‘Slick Woods’ as her friends call here is now a top 50 model from the hood. From homelessness to model fame, this young model of many, will continue to be of great interest as she sorts what is real. Will this new fame and fortune prove sustainable? We hope so. While she has a great discovery story, we certainly pray good thoughts for this protagonist’s amazing journey.